With so many hearing aids on the market, finding the right one for you can feel like a daunting task. You need something well made and reliable with technology that works for you. Having some information on the best brands and manufacturers can help you find what you are looking for. In no particular order, here’s our guide to the top six. Originally known as Danavox when they were founded in 1943 this Danish company was bought by GN Store Nord in 1977 and became the Resound Corporation in 1984. They were one of the first manufacturers to produce digital hearing aids. Their Resound Air range was released in 2003, these tiny behind the ear hearing aids had an open fitting, meaning that no ear mould was needed and the air could circulate within the ear canal. They have since produced a smaller Behind the Ear hearing aid, the Dot. In 2014, in collaboration with Apple they produced the first ‘made for iPhone’ hearing aid, the Resound Linx. For the first time, hearing aid wearers could stream sound directly from their iPhone, iPod or iPad without the need for an additional streaming device. Also known as Signa, Siemens are the world’s largest hearing aid manufacturer with a very wide range of products. Their work in the medical industry has assisted their hearing aid development leading to improvements in fitting and comfort. In 2011 they produced the first waterproof digital hearing aid, and their range also includes completely invisible and rechargeable models. Their work on background noise reduction has led to great improvements for hearing aid wearers. Pioneers of Bluetooth integration they have also produced a range of accessories for streaming sound from phones, tv and other media devices directly to their hearing aids. This is a Danish family owned company established in 1956. They produced the world’s first fully digital In The Ear hearing aid. In 2010 they produced the first hearing aid made just for babies and in 2011 introduced the first super power hearing aid for those with a greater hearing loss. In 2012 they introduced their ultimate Invisible In Canal hearing aid. Their hearing aids produce a natural sound quality in a range of different environments. They have also designed their own wireless technology, UNI-DEX, which allows the user to stream sound from various audio devices. They have a hearing aids with tinnitus treatments, the Zen range, and are able to measure hearing sensitivity through hearing aids with their Sensogram Technology. Keen to reduce their carbon footprint, their headquarters in Denmark uses renewable energy. This company owns hearing aid manufacturers Oticon and Bernafon along with many other companies related to audiology and hearing health. Their focus is on researching and developing hearing aids and implants, diagnostic instruments and communication devices. Oticon was founded in 1904 in Denmark. They produced one of the first digital hearing aids, the Digifocus. They have also created the smallest power Behind The Ear hearing aid, Plus Power, which helps people with severe to profound hearing loss. In 2014 they introduced the Streamer Pro, an accessory which allows the hearing aid wearer to stream sound from their iPhone and other Apple devices directly to their hearing aids. Bernafon is based in Switzerland and has been producing hearing aids since 1946. They have a wide range of products and in 2002 introduced a unique ‘channel free’ hearing system to give a natural sound. This American company was founded in 1967 and is still privately held. They were the first company to introduce a digital In Canal hearing aid and Invisible In Canal hearing aid that was also fully programmable, meaning that it could be customised to a person’s hearing loss. They were also the first company to use nanotechnology in their hearing aids, making them waterproof. Well known for their feedback reduction, their main brands include Audibel, MicroTech and NuEar. They were the second manufacturer to introduce a ‘made for iPhone’ range called Halo, and have hearing aids designed specifically for tinnitus relief, the Xino Tinnitus. Sonova is a swiss company whose brands include Phonak, Unitron as well as Lyric Hearing, currently the only invisible, extended wear and maintenance free hearing aid. Their Phonak range caters for all ages with a specially designed range for children. They also have excellent background noise reduction programmes. You need hearing aids which are reliable, long lasting and good value for money. These six manufacturers are at the cutting edge of new technology, their investment in research and development means that your hearing health is in safe hands. Who makes the best hearing aids? 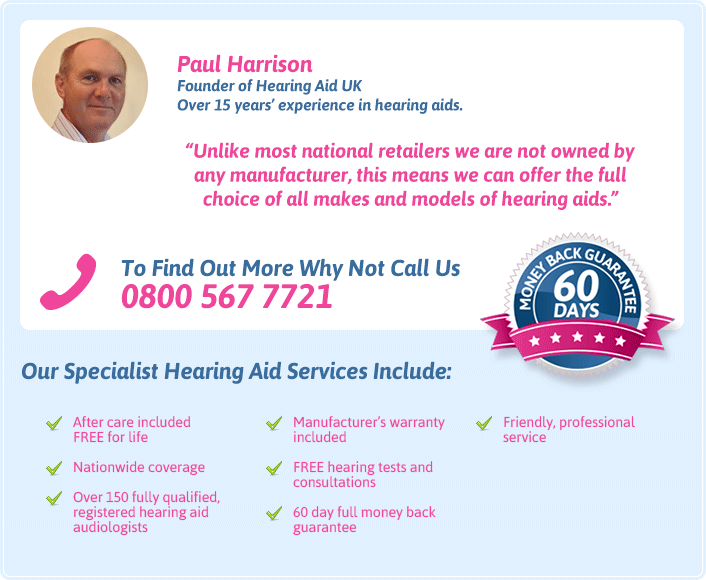 Here’s our guide to the worlds leading hearing aid manufacturers.